The Ram 1500 is one of the most popular light-duty trucks on the market today. This model year, the truck is getting slight equipment modifications, such as on the new R/T trim that is now available on the Sport model. Keep reading our 2015 Ram 1500 review for more details on this excellent light-duty truck. 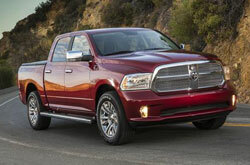 Truck shoppers in Scottsdale will find that the Ram 1500 offers many customizable options that fit a variety of needs. Drivers can opt for a regular cab, an extended cab or a crew cab, with each body style offering six trim levels. Of the six trims, our 2015 Ram 1500 review suggests choosing between the HFE (high fuel economy) trim, Sport (or R/T) trim or the top tier Laramie trim. The HFE trim - as its name suggests - is ideal for those wanting the most fuel economy out of their 1500. It also comes with a regular-cab body style and a gas V6 engine. The Sport trim level features new special R/T additions, such as 22-inch wheels, a unique hood, a limited-slip differential and a black grille with R/T badging. The Sport time also boasts a heated leather-wrapped steering wheels, a 7-inch driver information display, dual-zone automatic climate control, a rearview camera and a full center console. The Laramie trim adds chrome exterior accents, chrome grille inserts, a front bench seat and clear headlight lenses. The Laramie can also be turned in to a "luxe-truck" by adding either the Longhorn package or the Limited package that offers everything from keyless entry/ignitions, upgraded leather upholstery, heated rear seats and remote ignition. Under the hood, look for the 2015 Ram 1500 in Scottsdale to sport a standard 3.6-liter V6 engine that rates at 305 horsepower on the lower trim levels. The V6 is paired with an eight-speed automatic transmission. Higher trim levels come with a 395 hp 5.7-liter V8 engine that can be paired with either a six-speed automatic transmission or an eight-speed automatic transmission. 2015 Ram 1500 in Scottsdale. Stop by our showroom and take this terrific light-duty truck for a test drive today! 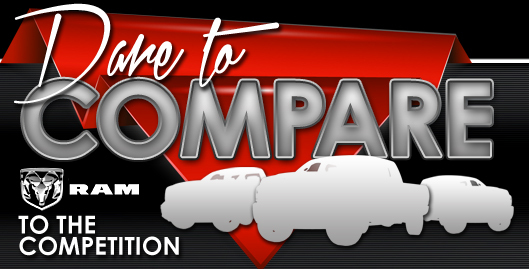 When you compare Ram's most current 1500 model head-to-head with the 2015 Chevrolet Silverado 1500, Ford F-150 and the GMC Sierra, you'll discover that it beats out the competition. With unique onboard technologies and an marvelous design, shoppers will love the 1500. You'll easily see it's a fantastic value when you compare its price to competing vehicles. View our facts list to learn more about the 1500 - bullets below this text. 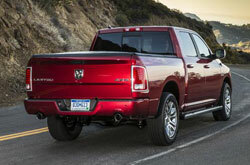 If you're having a hard time deciding which Ram is right for you, please read the 1500 review above, along with reviews of other current 2015 models sold at Airpark Dodge Chrysler Jeep. 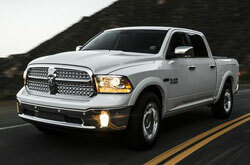 There is a reason why we are one of the Scottsdale area's top-rated Ram dealers. Just one reason is that we provide reviews transcribed by veteran automotive writers. As you read this article, you'll see that it is up to the hilt with matter-of-fact information about all the things you're looking for in the new 1500 - cabin features and other specs included. Not sure if the 1500 is a fit for you? Check out our online research library to read more Ram reviews and to compare Airpark Dodge Chrysler Jeep's models to vehicles from other brands.